This was another well planned and enjoyable international event sponsored by the CIPC and hosted by the Portuguese national club - which did a fantastic job. In addition to the slow smoke competition, participants were treated to a Gala Dinner and spectacular Fado show in the elegant Estoril Casino, as well as to an interesting pipe show organized by Peter Heinrichs, with many well known European carvers (and some newer ones) in attendance. There were endless opportunities during the weekend to visit with pipe smokers from around the world, to catch up with old friends and to make new ones - or just to smoke and gaze out over the sea. Read Raymond's excellent report on his experience. 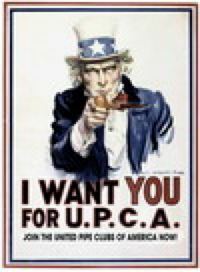 UPCA's only regret is that more American smokers could not attend. Next year the international compeition will be held in Eindhoven, the Netherlands. The Dutch host club already is hard at work and no doubt will put on another not-to-be missed pipe smoking frolic. All members of UPCA clubs are eligible to attend and invited to participate. So stay tuned for more information as the year goes on and let's plan to send a larger UPCA delegation to Holland next October.